Much like its predecessor, “Dawn of the Planet of the Apes” touches on some pretty interesting sociopolitical themes like power, trust and gun control, but the script isn’t very subtle about it, hammering the audience over the head to the point of exhaustion. In fact, one of the biggest problems with both modern “Apes” films is that they take themselves a little too seriously at times. There’s nothing wrong with adopting such a somber tone, but the filmmakers open themselves up to criticism when they don’t apply that same logic to the movie. After all, this is a film that not only asks you to believe that an entire species could evolve this quickly over the course of 10 years, but that they’ve become advanced to the point of being able to ride horseback while firing a machine gun without even an ounce of humor. The story itself is also fairly predictable, populated with characters that we’ve all seen a thousand times before doing exactly what we expect them to do. (Kebbell’s Koba is the worst offender.) 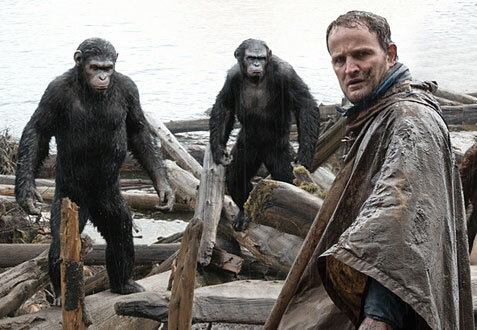 As a result, it’s just not as engaging on a dramatic level, and part of that has to do with the decision to spend so much time with the apes, though you can hardly blame Reeves when the humans (played by dependable actors like Gary Oldman, Keri Russell and Kodi Smit-McPhee, who deserve better) are so one-dimensional. But while Caesar may be the “hero” of the piece, it doesn’t make it any less confusing as to who the audience is supposed to be rooting for, since both camps are mostly comprised of good people with a few bad apples that ruin it for everyone else. 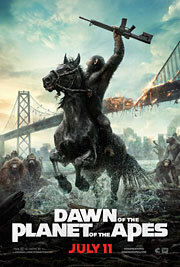 What it lacks in originality, the movie makes up for in sheer visual spectacle. The action sequences look amazing, but it’s the relationships between man and ape, as well as ape and ape, that are the driving force behind the film, and they wouldn’t be nearly as effective without the groundbreaking technology on display. The apes feel so much like living, breathing beings (especially the orangutan Maurice) that you sometimes forget you’re watching a computer-generated creation, and that’s to the credit of Weta Digital’s work behind the scenes just as much as the motion-capture performances of Serkis and his Lyrca-suited co-stars. Serkis is excellent once again as Caesar, proving himself worthy of top billing with a dynamic screen presence. (Yes, even behind all that digital hair.) But with so many ape characters fighting for face time in this second installment, the gimmick loses some of its “wow” factor, partly because what made Caesar so magical in the first film was the fact that it was essentially a silent performance. That doesn’t take away from what he’s accomplished here, however, because “Dawn of the Planet of the Apes” is still a damn good sequel. It’s not as smart and poignant as the 2011 prequel that made this movie possible, but it’s a step up from most summer blockbusters, blemishes and all.